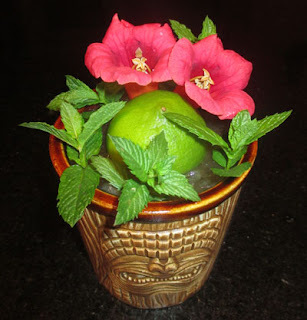 Blend with 8 oz crushed ice and pour into a small Tiki bowl filled with ice. I continued on with the post-shift Tiki drinks on Saturday night with inspiration coming from Beachbum Berry's Sippin' Safari. The recipe that caught my attention was Kelbo's Scorpion, the 1950s variation of Trader Vic's classic Scorpion Bowl, that was created at Kelbo's on Fairfax. With the spirits split three ways into brandy, rum, and gin, it reminded me of a Fog Cutter. The major differences are that Kelbo's Scorpion used lime instead of the Fog Cutter's lemon; moreover, Kelbo's Scorpion had passion fruit syrup and the Fog Cutter had Angostura Bitters and a sherry float. Kelbo's Scorpion let forth a floral, minty, and lime aroma. Tropical notes filled the sip as the lime, orange, and passion fruit flavors mingled. Finally, the swallow shared funky rum and the gin's juniper, and it ended with a nutty citrus finish.